Read 2 times. Last read July 21, 2011. I sooo loved this book! A great book for middle/jr high as well as high school for its depiction of a Muslim family fleeing the Taliban in Afghanistan after 9-11. Fadi and his family have tried to stay in their beloved country but the war has driven them from their home. Fadi's father, Habib, has paid the last of their money to flee their homeland. Fadi's family is close-knit, loving, and care deeply for each other. Fadi's mother, Zafoona, is ill and his sister, Noor, is helping her escape and Fadi is responsible for Mariam, his little sister. It is when they are leaping from one truck to another, that the Taliban attacks, and Mariam breaks away to pick up her doll, that Fadi loses his grip on his little sister. Once the family reaches safety in the United States, they try to locate their precious family member, in whatever way they can. Fadi begins school in a country very foreign to him, but he makes friends and also experiences bullying because he is Muslim. What I really enjoyed was how Fadi mentions his favorite book, From the Mixed-up Files of Mrs. Basil E. Frankweiler, and how he relates to Claudia and her escapades in the museum. Fadi loves photography and uses his father's camera which took many a picture in Kabul. It is this love of photography that inspires Fadi to join a school contest in which the winner will win a trip---and Fadi is determined to win that trip and return his lost little sister to their heartbroken family. Fadi has so many things against him but he also has determination and with his new found friend, Anh, they both hope to bring Mariam home---but, will they succeed? This such a great book, great characters, believable plot, and the themes of belonging resonate in each chapter of this wonderful book. 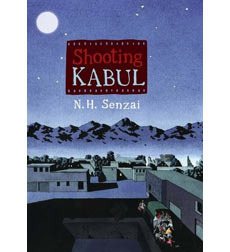 Sign into Goodreads to see if any of your friends have read Shooting Kabul. This was mentioned in an SLJ article today (http://www.slj.com/2017/03/diversity/...) and with the references to From the Mixed-up Files of Mrs. Basil E. Frankweiler, I HAVE to read it now. Middle school - LAI, Thanhha. Inside Out and Back Again & her other title too, Listen Slowly. YA The Good Braider and The Sun Is Also a Star. Thank you! Adding to my ever growing TBR list. Just had cataract surgery and now I can SEE again. Being able to read again is the best!